Looking for Shower Repair or Installation in Lees Summit? With all the companies out there offering Lees Summit Missouri shower services, it may be hard to choose which one’s right for you. Here are a few key points that set Kevin Ginnings Plumbing Service Inc. apart from other shower repair companies. Whatever you need to do to your shower, we at Kevin Ginnings Plumbing Service Inc. can help you do it. Would you like a new shower head? We can do that. What about repair? Kevin Ginnings Plumbing Service Inc. has been fixing Lees Summit’s showers since 1985, and we’ve got you covered. We can take care of any shower need. Whenever you need someone to help you install, maintain or repair a shower, you can call on Kevin Ginnings Plumbing Service Inc., whatever the time might be. We’re available 24/7 to help all Lees Summit MO residents with their shower problems. Let us unclog your shower head tonight so you can shower tomorrow morning. Call (816) 832-4322 to ask us how we can help you customize your shower experience. Many people choose to get new low-pressure shower heads to save money. 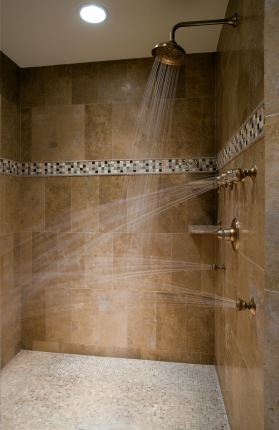 However, we can also help you adapt your Lees Summit shower to fit your needs, whatever those might be. We can install dual shower heads, overhead shower heads, misting shower heads, hoses, and more. We can help you get whatever you want out of your shower in Lees Summit. Whether you need emergency shower repair, or you just want to make your shower more comfortable, we can help you with every common shower problem. Call (816) 832-4322 today to find out why Kevin Ginnings Plumbing Service Inc. is Lees Summit MO’s preferred plumbing company!